A parent shared with me that she struggled motivating her son to build a model of a Frank Lloyd Wright home for a presentation. This was part of a social studies unit in which he studied the architect. Her son had no interest in building the model or researching Frank Lloyd Wright. I asked what her son liked to do outside of school. Tops on his list was playing Minecraft, a game where players construct buildings, grow harvests, care for livestock, and do many other things in an unstructured sandbox world. When I suggested that he could build the model in Minecraft, she immediately saw the possibility. Of course, he'd have to convince his teacher that the task could be done, and that a video could be made to demo the work. The teacher recognized the opportunity, and the boy threw himself into the research and design with energy and enthusiasm. His work is referenced midway in this article on being constructivist in a Common Core classroom. Student interest in a topic holds so much power. 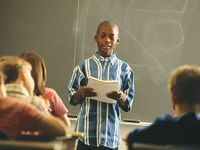 When a topic connects to what students like to do, engagement deepens as they willingly spend time thinking, dialoging, and creating ideas in meaningful ways. Making learning contextual to real-world experiences is a key learning technique with differentiating for student interests. Often the core content and concepts are represented in the world beyond the classroom or school building -- in ways that students cannot see, as if they're walking through life wearing a blindfold. When teachers plan for content, processing, and product, differentiating by interests helps remove the blindfold so that learners can see those invisible concepts made visible. Factoring for student interests works well with instructional planning based on readiness and learning profiles. Readiness combined with interest leads to students doing work at a respectable complexity level with the familiarity of a topic that they relate to. For example, students could write persuasive reviews about games or items that they know intimately, or they might explore science concepts through LEGO Robotics. Matching learning profiles with student interest allows learners to process understanding of concepts through different modalities based on their own experiences. One example is students watching videos, listening to speakers, and journaling to make comparisons between social injustices from the past and forms of bullying that occur in today's schools and communities. The first step to differentiate for interests is to find out what students care about and like to do. Student surveys and learning profile cards are two methods for collecting the data. Parents and students providing these details send the message that their experiences matter. That is a powerful message to start off the school year or semester. 1. Have clear learning criteria and ensure that students understand them. Establish what academic skills and concepts must be represented in the product. Be careful to avoid assessment fog. When students understand the targets, they can effectively design their own products -- with coaching support for some more than others. 2. Limit the options to a manageable number. Start conservatively by providing two structured options. Then invite students to create their own option, based on the learning criteria. The teacher listens to the proposals and suggests tweaks as needed, or sends students back to the drawing board when a proposal is not viable. Set a deadline when proposals are approved. Students who don't meet the deadline must choose from the original two options. We're all motivated by tasks that interest us. Like our students, when we care, we willingly spend hours carried away with researching, crafting, and revising our work. Learners are less daunted about tackling complex work with difficult obstacles if the topic interests them and if they have a voice on how to accomplish the work. If this approach is good for professionals, why not use it for our learners? Please share your own strategies for empowering student choice.